I made it back to the Owyhee today and the fishing was great! The water flow and levels were way down which made the wading much easier. I ended up netting 18 fish today, as long as you count the 1 Crappie I caught. It must have got flushed down the glory hole when flows were high. Only 7 of the fish were over 21" but I caught all of them with a Calibaetis on the surface. It was awesome! If they were not over 21" they were less than 12", so I caught more small fish then big but still had a great time and I was using the right flies to hook up. I finished the season just like I started, by having a productive day on the Owyhee River. I have hit the water a couple of times since my trip with Dan but not too much to report in my fishing log. I went today and caught just 6 before the weather turned on me. The water is still about 6"-8" higher than I like to see it which kept me out of some of my favorite water. I had a couple nice fish I netted with black zebra midge and a dry caddis. Fish beware....I will be back when the water drops a little more. 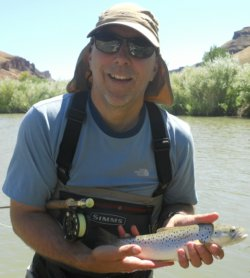 My brother-in-law Dan came to town this week and we hit the Owyhee River. We got there around 7:30 in the morning and had some pretty decent luck early in the day. We only saw a few heads all day. We were catching fish with zebra midges and streamers. We each caught 7 or 8 fish, this is one of Dan's fish that was around 17" long. I just recently started using streamers, I thought the flies needed to look like bugs. Today I saw great examples of why to use streamers. On two occassions I caught fish in the 8"-10" range, and both times that I was bringing them in there was a nice size brown chasing them. I threw a black Wooly Bugger on and a few casts and strips later I netted a nice fish. 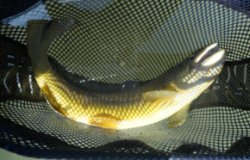 Here is a nice 23" fish I netted. It isn't the longest fish I caught this year but it is probably the biggest. I wanted to get a nicer picture of this baby but he caught tangled up in my net with some of the fishing line. I caught this one with a zebra midge dropped from a pheasant tail. We called it a day around 4:00. The clarity of the water was much improved from 10 days ago. You could actually see into the water about a foot or more making the fish easier to spot. On my next trip I hope to go in the evening and spend the night. This will allow me to fish during the peak evening hours and good early morning hours. Hopefully that will increase my fish counts. This was a great day fishing with one of the nicest guys you could ever know. Thanks for going Dan! Fish on! I returned to the Owyhee today and the fish were not good to me. I netted only 6 today. The catch of the day measured 22" using a bead head pheasant tail. The rest were all under 18". The river is still dirty. You cannot see the fish unless they are within 6" or so of the surface, only saw a few heads. It is not like last year. 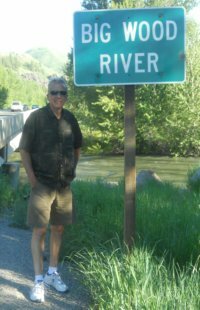 My wife and I went to Sun Valley last week and saw the Big Wood River and Silver Creek. The Big Wood was running high and fast, you couldn't fish it no matter how bad you wanted to. Silver Creek is running normal for this time of year. I didn't do any fishing, I knew the Big Wood was too high. We already had hotel reservations so still came to town. Great weekend! Maybe next time. I returned to the river to find it had changed. The flows have dropped to normal summer flows and that is great. The problem is the river was really muddy. There is usually a strange color to the water but today it was just dirty. Once the mud is cleared out of the river it should be great. I ended up netting 7 fish. All with nymphs, and all were less than 20" long. If you read my report from the 22nd you will understand why I felt disappointed. I was there from early morning until about 3:00 and just never saw any risers. I will be back, but it will be a couple of weeks. Fish on! I had a great day today on the Owyhee River. My fish count was 15, which doesn’t include the 5 I lost today. I lost one right at the net. The fish count was big and so were the fish. I somehow caught one 8” fish but everything else was 20” or greater. 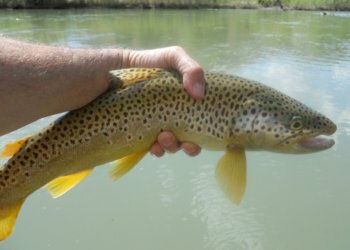 I started the day with a nice 24” brown that I caught with a dry Calebaetis. I ended up with 2 of that length but the first one was a little fatter. 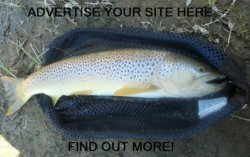 Take a look at the picture, it is the first Brown Trout. It reached 95 degrees on the Owyhee today, which is normal for this time of year. But it was in the 70’s yesterday and has been for most of the month. This has been a crazy year in the Boise area, like other places I am sure. Between the bad weather and the ridiculous water flows it is just now getting to be fishable. Here it is the 22nd of June and this is the first time I have been fly-fishing all year. Crazy, I usually start in March and would have 3-5 trips in already. Oh well, I guess it was worth the wait. The day started a little slow. I got to the river and could see the water was moving a little faster. It was about a foot deeper than normal in most spots that I went to today. The depth is the bigger issue. It takes away some of the wading opportunities and limits how far out in the water you can go. So it is probably good that the fishing group I was going to fish with today got called off because we would not have been able to fish around each other. I decided to go any way not knowing what to expect. I just needed to go fly-fishing. I took all the pictures by myself....do you recognize my arm? There was not much traffic on the river today. I only saw 6-8 others on the water. But of course my favorite spots were gone. I decided to try an area up from one of my best spots because I knew the water would be shallow and I thought it would give me my best odds. I have not fished that stretch before. I caught 2 at that spot before moving on. I went to another shallow area and stayed for about 45 minutes. It was shallow but I just could not get my fly in front of them, they were too far out. I also realized that my floatant was not working very good and ended up replacing it with a new bottle. This paid huge dividends later. Make sure you have an extra bottle on hand when you fish. I get mine at BIG FLY COMPANY (see their link below). I caught 3 more fish at one of my favorite spots on the river, which is not too far from the upper bridge. I caught each one using the double dropper with a pheasant tail on top and a black zebra midge below. The zebra won 2-1. 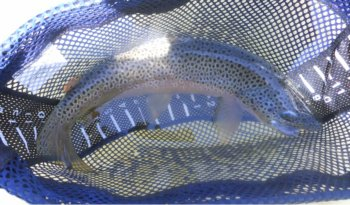 See the Owyhee River hatch chart. Then I found the place to be, just across from the kids camp. I pulled along the road slowly and I could see fish sipping the top, and there were lots of them. I have tried this spot before with not much luck, but today they were hungry. I pulled 10 fish out of this stretch before packing it in around 5:30. I would toss my Calebaetis a few feet in front of their heads and wait for the strike. There is nothing like a fish taking a dry, it is exciting. Part of my success has to be because the fish were hungry, and they have not seen many anglers this year. My techniques will need to keep improving as the fish get wiser and the year rolls along. Throwing a 15 on the board right out of the gate will be a big test to beat. I had a great day on the river, one I will not soon forget. Usually I would see more fish in the 17”-19” range, but I guess I will settle for one 8” and fourteen over 20”. If you look at my net closely you will see that it has measurements inside the net, so I always know how big each fish is that I land. 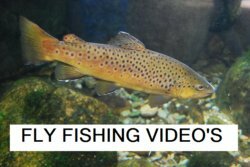 It starts at 0 in the middle and counts one inch at a time up to 15 on both sides, you just got to get the fish to lay flat. Here is one that is available from Cabela’s, it retails for $39.95. Just click on their link at it will take you too it. It is a great net for these big fish. The Owyhee River is still running high at 6500 cfs. It will probably be a couple more weeks before I am able to hit that water. The good part of high river flows is it gives me an excuse to get some honey-do's done before I take the summer off for fishing. I tiled my bathroom a few weeks ago and I got my yard looking good. Golfing today with my son and brother so life is good even without fly fishing. But I am so ready! I know my river is not the only one running high, the mighty Mississippi is running extremely high so I am guessing all the tributaries are as well. Soon we will all be out on the streams throwing some flies but until then we can all just hope there is no loss of life or property with all the raging waters in America. I was cleaning up some old emails and I stumbled across these photos. It is not fly fishing but check out this large fish. 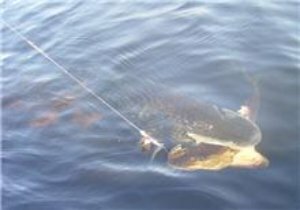 The big Pike in this photo weighed 56 pounds and the small one is 36" long. The large fish hooked on to the small fish after it was hooked. Talk about determination. The large fish would not let the smaller fish (36" isn't very small) go so this lucky fisherman landed both fish. 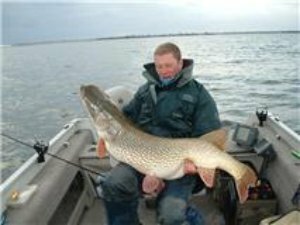 He is pictured here with the massive Pike! The weather in Boise has been rainy most weekends up until last weekend. I wanted to go to the Owyhee River really bad, but they raised the levels on Thursday to over 7,000 cubic feet a second. Good luck with that! That will mess things up for at least 3 weeks if not more. Most of the rivers in my area are closed until Memorial Day weekend. I have traveled with my job a lot since January, and I have not been able to take any days off when the weather has been nice. I have traveled to Indiana and California for business, and I have not been able to hit the water. I will make up for it as soon as the water flows are back to normal. Hopefully soon I will have some good news in my fishing log. All I have been able to do so far this year is talk about fishing. I have made plans with my buddies from UPS (Kent, Rich and Bart) to hit the Owyhee in June. Sorry Mike K, I hope you catch some browns in New Zealand! I also plan on either a trip to Montana or Washington this summer for more fly-fishing. I have plenty to look forward to, but I sure wish I was fly fishing right now! Just got my package from Big Fly Co. I got some flies, leader, tippet and a new floating fly line to try out. I just put my new fly line on one of my reels so I am all ready to hit the water. 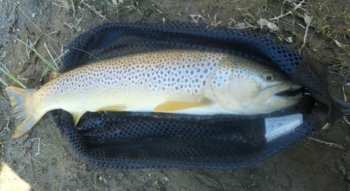 I just need to catch a break in the weather and my work schedule and then I will be netting me some nice Browns on the Owyhee. I have two more trips out of town coming up and then I should be home and able to fish. Every year I purchase this type of stuff from the Big Fly Co. 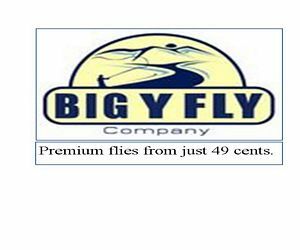 They have great prices on flies, and free shipping if the order is large enough (over $35), and they ship it pretty fast. I have had great luck with what I have purchased from them. They got a great website as well. Click their logo and check them out. Leave my fishing log and see where else to fish.